Heritage Farm Nurseries has been one of Wallington’s best-kept secrets for mums in the know. With a fab new indoor cafe, comfy sofas, log fire and play-area for kids, owner Fiona is keen to let more families know about it. Ever since one Local Mum reviewed�Heritage Farm Nurseries�as a ‘family-friendly little gem’ and her favourite place to take her kids for a day out, local mums have been keen to check out the award-winning aquatic centre and its original, family-oriented cafe. 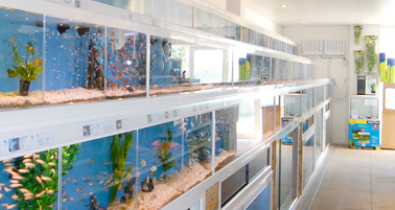 In 2008 the family diversified again into reptiles�and small pets�and Heritage Farm now boasts an incredible selection of reptiles including snakes, bearded dragons and geckos. Their indoor small pets area houses the more cute and fluffy variety of small animals, including hamsters, squirrels and chipmunks. Meanwhile the outside pets area has adorable fluffy rabbits, giving the centre baby rabbits for the first time this year. The farm is also populated by amazing chickens and ducks that wander freely around the grounds entertaining the visitors. There is also an attractive garden for warmer days where visitors can sit and enjoy the sun as they eat while the children play in the huge sandpit. The cafe’s own strawberry patches produce berries you can buy or sample as part of the traditional afternoon cream tea. And to add a modern touch to the traditional charm, WiFi is now live in the Tropical Garden Cafe and free for all customers to use. If you’ve never sampled the many delights of Heritage Farm, why not give this exciting aquatic centre and nurseries a visit? Not only are there loads of things for the kids to explore, it’s a wonderful place for mums to relax and recharge too - and all this on our doorstep! Edit 15/01/13:�Heritage Farm is currently closed due to negotiations with Surrey County Council �about rent.�Read our news story.